You’ve seen the scenario play out before: You start something running-related—a training program, a tempo session on the track, a self-care practice like foam rolling, your target race—and you are gung ho. You are confident you will NAIL IT this time, despite your history telling you otherwise. Then the flu invades your house, and three weeks of missed workouts fly by. Or, demoralized by your splits, you quit the workout halfway through. Or dinner prep + gymnastics carpool duties + endless emails derail your evening foam rolling plans. (And you were going to plank during every commercial, too!) Or you get to mile 11 of your half-marathon, totally on goal pace, but your legs are pissed and your mind has WTF on repeat, so you let yourself off the hook. Here’s the thing: Your intentions aren’t bad. You're not weak or wishy-washy or wrong. You just need an assist from the complex organ that lives in your head a.k.a your brain. It happens to play the starring role in how the rest of your organs and muscles function. In order to optimize your running, you eat well, you do your push-ups and planks and squats, you foam roll (occasionally, at least). In order to thrive, you also need to address your mental skills: things like learning how to channel thoughts, deal with anxieties, set appropriate goals, and manage your internal dialogue. When you do that, you can execute the training cycle, race or season—or all three!— that you desire. In these unique sessions, Dr. Justin Ross, a sports psychologist in Denver, will lead you through three separate stages of integrating a high-performance mindset into your training. And by the way, we realize high performance mindset sounds like a high-falutin’ program for natural athletes who regularly finish near the top of their age group. That’s so far from the truth. 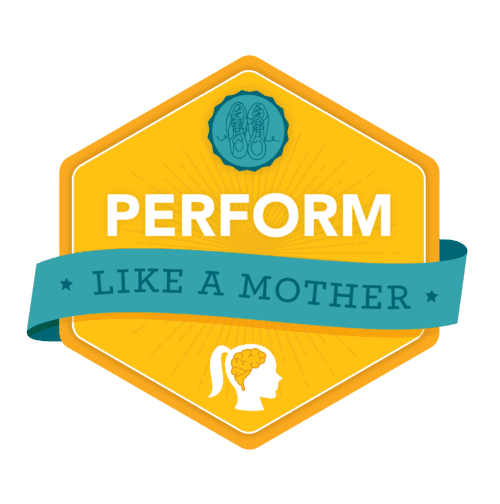 Perform Like a Mother is for athletes of all levels who want to get the best out of themselves, whether that means showing up for 100% of a training plan, quieting the "I-can't-do-this" voices echoing in your head, finally hitting a sub-30 5K, grabbing a half-marathon PR, or taking on a new-for-you distance. Each session is 90 minutes. It’s in a webinar format, so you’ll be able to interact with Justin and your fellow attendees. Enough time that you can ask individual questions and benefit from hearing about other women’s situations. Prior to the session, you’ll complete a short worksheet to give Justin an idea of your background and how he can help you best perform like a mother. During the 90-minute session, we’ll split the time between presentation and questions from you, making sure we’ve got plenty of time to address your questions. After the session, we’ll make the webinar video available to you so you can watch (again and again) at your leisure, and we'll also turn it into a podcast. October 30 SESSION: Session III: Executing High Performance on Race Day In this session, you'll: ★ Link motivation and performance, grounding your race effort in tangible reasons. ★ Gather best practices to set the pre-race stage, preparing for topnotch performance. ★ Review in-race strategies to prepare your mind (and body) to achieve success. ★ Tap into ways to utilize mental toughness to push your limits. SEPTEMBER 11 SESSION: Session III: Executing High Performance on Race Day In this session, you'll: ★ Link motivation and performance, grounding your race effort in tangible reasons. ★ Gather best practices to set the pre-race stage, preparing for topnotch performance. ★ Review in-race strategies to prepare your mind (and body) to achieve success. ★ Tap into ways to utilize mental toughness to push your limits. Metabolic Reset: The Mental Side is a special event for women who have gone through a Metabolic Reset with nutritionist Ellie Kempton. (You can have either completed the group Reset in the Train Like a Mother Club or worked one-on-one with Ellie.) Ellie has capably guided you through the physical side, but the new perspective on your body isn't fitting as well as your smaller-sized jeans. Enter Denver-based psychologist Justin Ross, who has worked regularly with clients who have been in a similar position. He specializes in helping people address the necessary mental, emotional and behavioral change in order to live and sustain a healthy, desired life. Together, Justin and Ellie will dive into the mental and social side of weight loss so you have some new thoughts, tools and tricks to keep your head in the game. In this one-time seminar, we are going to focus on questions such as: ☆ How do I truly celebrate this new weight as my new normal? While I love it, I also live in fear of rebound, especially having a history of yo-yo dieting. ☆ How do I maintain mental momentum needed for weight loss when there really is no "finish line" like at a race? ☆ I feel like my identity is changing along with my weight; sometimes I'm not even sure I know who I am anymore. How do I manage the roller coaster, both personally and in my relationships, of a changing identity? ☆ How do I maintain emotional resiliency when socializing around food, especially in the midst of well meaning co-workers + friends? I keep finding myself apologizing or explaining myself when I turn down “food gifts.” ☆ What can I do to ditch the self-sabotage routine? I’m doing so well and then a silly brownie derails me. Before I know it I’m taking a free “day” instead of a free “meal"—and my emotions plunge and my self-judgment sky-rockets. How do I nip this vicious cycle in the bud? We'll also leave time to answer your individual questions—as always, no question is too basic or TMI. After the event is over, you'll receive the link to the video to watch again if you'd like; a private podcast to download if you want to listen again; and a one page recap to remind you of helpful tactics and thoughts as you continue to solidify your new body + mindset. This event will be on Wednesday, July 11 at 1 pm-2:30 pm ET/10 am-11:30 PT. Not available during that time but want the information? Register, and send us your questions prior to the seminar. You'll then be able to watch/listen at your leisure. Other questions? Happy to help. JUNE 19 SESSION: Session III: Executing High Performance on Race Day In this session, you'll: ★ Link motivation and performance, grounding your race effort in tangible reasons. ★ Gather best practices to set the pre-race stage, preparing for topnotch performance. ★ Review in-race strategies to prepare your mind (and body) to achieve success. ★ Tap into ways to utilize mental toughness to push your limits. MARCH 20 SESSION: Session III: Executing High Performance on Race Day In this session, you'll: ★ Link motivation and performance, grounding your race effort in tangible reasons. ★ Gather best practices to set the pre-race stage, preparing for topnotch performance. ★ Review in-race strategies to prepare your mind (and body) to achieve success. ★ Tap into ways to utilize mental toughness to push your limits. September 24 SESSION: Session II: Developing High-Performance Mindset In this session, you’ll: ★ Connect your mind + body, acquiring practices to optimize the relationship. ★ Consider your self-talk before, during, and after a run. ★ Sort out your fears, and say sayonara to self-sabotage. ★ Process your approach to hurdles and find out how to clear them effectively. AUGUST 21 SESSION: Session II: Developing High-Performance Mindset In this session, you’ll: ★ Connect your mind + body, acquiring practices to optimize the relationship. ★ Consider your self-talk before, during, and after a run. ★ Sort out your fears, and say sayonara to self-sabotage. ★ Process your approach to hurdles and find out how to clear them effectively. MAY 15 SESSION: Session II: Developing High-Performance Mindset In this session, you’ll: ★ Connect your mind + body, acquiring practices to optimize the relationship. ★ Consider your self-talk before, during, and after a run. ★ Sort out your fears, and say sayonara to self-sabotage. ★ Process your approach to hurdles and find out how to clear them effectively. FEBRUARY 20 SESSION: Session II: Developing High-Performance Mindset In this session, you’ll: ★ Connect your mind + body, acquiring practices to optimize the relationship. ★ Consider your self-talk before, during, and after a run. ★ Sort out your fears, and say sayonara to self-sabotage. ★ Process your approach to hurdles and find out how to clear them effectively. THIS SESSION: Session I: Setting High-Performance Foundation You will: ★ Find your motivation and learn strategies to minimize road blocks. ★ Set appropriate goals for different chapters of your athletic journey and stage of life. ★ Explore commitment and its challenges and learn to remove intimidation from it. ★ Delineate success for you, a definition that impacts your running—and life.